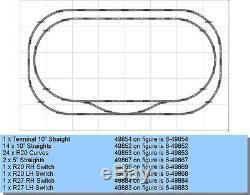 Li onel American Flyer S Gauge Inner & Outer Loop Track Pack R20 Curves have a 20" Radius and 40" Diameter This complete track set will allow you create this detailed layout shown. No additional track is required. INCLUDES: 1 x 10" Terminal Section (6-49854) 14 x 10" Straights (6-49852) 24 x R20 Curves (6-49853) 2 x 5 Straight (6-49867) 1 x R20 LH Switch (6-49868) 1 x R20 RH Switch (49869) 1 x R27 RH Switch (6-49884) 1 x R27 LH Switch (49883). From Bulk track NOT in Lionel box. Lionel never issued this as a pre-packaged item. Dimensions assembled: 5' x 8. This is Lionel American Flyer FasTrack S Gauge Track. And receive our final invoice to pay. All items must be paid within 7 days. 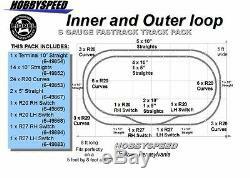 The item "LIONEL AMERICAN FLYER FASTRACK S GAUGE INNER & OUTER LOOP TRACK PACK Layout NEW" is in sale since Tuesday, June 14, 2016. This item is in the category "Toys & Hobbies\Model Railroads & Trains\S Scale\Track". The seller is "hobbyspeed" and is located in Indiana, Pennsylvania.